Parish News 16. 2. 2017. Masses during the Week: Mass on Monday and Tuesday at 9.30 a.m. Wednesday is Ash Wednesday, Masses at 9.30 a.m. (Clonmult) and 7.30 p.m. (Dungourney). There will be the blessing and distribution of ashes at both Masses on Wednesday. Mass on Thursday at 9.30 a.m. Masses on Friday at 9.30 a.m. and 7.30 p.m. Mass on Saturday at 10.00 a.m. The monthly “First Saturday” devotions continue next Saturday in Clonmult. Rosary and prayers at 9.45 a.m. followed by Mass. Last Week’s Collection: Door – €216.27. Thank you. The Monthly St Vincent de Paul Collection will be taken up as you leave the Church today. 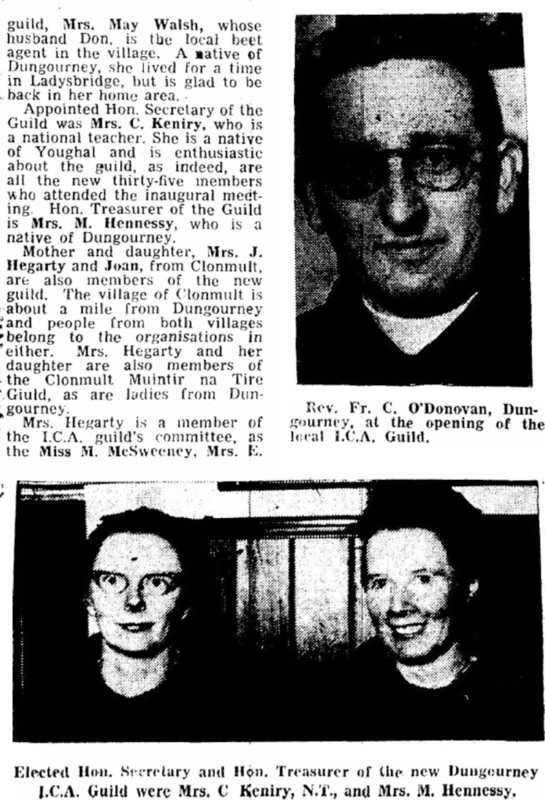 The 8.00 p.m. Mass this weekend is being offered for the deceased members of Dungourney G.A.A. Club (R.I.P). Mon, 6th March: Garrylaurence, Corbally – John & Frances Hennessy. Tue, 7th Mar: Clonmult – Clonmult Hall. Fri, 10th Mar: Rathcanning, Bawnadown, Ballygibbon etc. – William & Martina Leahy. All Station Masses at 8.00 p.m.
Clonmult Church: Cleaners for March – Siobhan O’Keeffe and Angela Ahern. Pioneer National Ball. The 21st Pioneer National Ball takes place on Sat 8th April 2017, in the Sheraton Athlone Hotel, after 6.30 p.m. mass in St. Mary’s Church, Athlone. Tickets €30. Guest Speaker- Jim Bolger. Music by Nite Fever. For tickets/info – contact Brenda Lynch 087-6189411or Dermot Fagan 085-7201646. Earthquake Cycle is being held on Sunday 5th March in aid of Time for Tilara’s trust. So just to be aware there will be cyclists on the road on Sunday morning. For more info look at “Time for Tilara” on Facebook. GAA Lotto 20. 2. 2017. No’s Drawn, 19, 21, 24. Parish News 19. 2. 2017. Last week’s Collection: Door €368.56. Thank you. Anniversaries: Monday is the anniversary of “The Clonmult Ambush”, we pray for all those who lost their lives there. May they rest in peace. Clonmult Church: A new list for readers is now available and can be collected in the sacristy. Congratulations to Tara Cronin and Aidan Rigney who were married in Dungourney Church on Saturday. A Musical Evening of Classics and Favourites with the Band of 1st Cork Brigade, in St. Colman’s Cathedral, Cobh on Friday 10th March at 7.30pm. In aid of the Cathedral Pipe Organ Restoration Fund. Tickets €20 available from Fr. Frank and Fr. Barry. GAA Lotto 12. 2. 2017. No’s Drawn, 7, 12, 16. Parish News Sunday 12. 2. 2017. Masses during the Week: No Mass on Monday. Mass Tuesday to Friday at 9.30 a.m.
Last Weeks Collection: Door – €254.15. Diocesan – €222.92. Thank you. The Faithful Departed: We pray for Una Brice (Aghada) who died recently and Bill O’Driscoll whose anniversary occurs at this time. May they rest in peace. Candlemas: A big thank you to all who donated candles or money for candles in both churches. Meeting of Dungourney / Clonmult Liturgy Group on Tuesday 14th February at 8.00 p.m. in the priest’s house. Pope Francis invites us to celebrate St. Valentine’s Day. In his document the Joy of Love (Amoris Laetitia), Pope Francis refers directly to Saint Valentine’s Day as the opportunity to make the most of traditional religious practices, invite couples to grow in love and help their children to prepare for their future married life. This is why, as part of the preparations for World Meeting of Families in Ireland in August 2018, we invite you to mark this St. Valentine’s Day in a special way. Lourdes – 1st to 6th June 2017. Booking is now open with Joe Walsh Tours, 117 Patrick Street, Cork. Tel: 021-4277959. Sick / Assisted Pilgrim application forms are available from The Parish Secretary, 27/28 Bank Place, Mallow. 022-20276. The Annual Lourdes Mass will take place on Friday 10th February in St. Mary’s Church, Mallow at 8.00 p.m. The Diocesan Pilgrimage to Knock is on Sunday 14th May. Parishes to make their own travel arrangements. A Serenade to Spring: A concert by Castlemartyr Choir, Castlemartyr Children’s Choir and Kiltha Tones in aid of The Friends of Marymount Hospice and St. Anne’s Church Castlemartyr. Friday 24th Feb at 8.00 p.m. in Castlemartyr Resort. Tickets – €12.00. Book with Lottie West 021-4667311, Martina Joyce, Castlemartyr Post Office 021-4667111, and Ina McCarthy Flowers 021-4613807. Progressive 45: Clonmult Old School Wednesday at 8.00pm. All card players welcome. Dungourney GAA Lotto results: Lotto results 06 February 2017. Lucky Numbers – 18, 19, 22. No Winner. Lucky dips Orla Kelleher, Brian Ronayne, and Mary Browne. Next week’s jackpot €2,250. GAA Lotto 5. 2. 2017. No’s Drawn. 18, 19, 22. Parish News Sunday 5. 2. 2015. Masses during the week: Monday to Friday at 9.30am. Saturday is the Feast of Our Lady of Lourdes: There will be Mass at 10.00am. It is also World Day for the Sick, so the Sacrament for the Sick will be administered during Mass on Saturday morning. Last Weeks Collection: Door €283.34. Thank you. Diocesan Collection: First Sunday of the month the usual Collection for Diocesan Purposes will be taken up. The Faithful Departed: Anniversaries Jim Ahern, Edmond, William and Mary Fitzgerald. May they rest in peace. Diocesan Pilgrimages 2017: Lourdes 1st to 6th July, booking is now open with Joe Walsh Tours. Tel 021/4277959. Diocesan Pilgrimage to Knock is on Sunday 14th May. Parishes to make their own travel arrangements. Diocesan Pilgrimage to Fatima 7th / 14th September 2017. This is the 100th Anniversary of the Apparitions of Our Lady of Fatima. Contact Pilgrimages Abroad Lauri Duffy Travel. Dublin 01/6359300. A Serenade to Spring: A concert by Castlemartyr Choir and Kiltha Tones in Aid of The Friends of Marymount Hospice and St. Anne’s Church Castlemartyr, Friday 24th Feb. at 8.00pm in Castlemartyr Resort. Tickets €12. 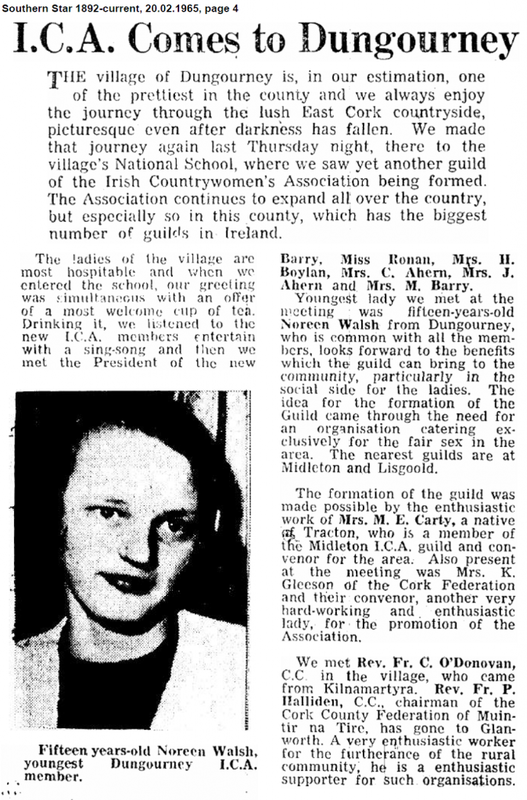 Contact, Lottie West 021/4667311, Martina Joyce Post Office 021/4667111, Ina McCarthy Flowers Midleton 021/46138067.